At THE GOLDEN AGE OF MUSIC VIDEO, we love all things ZZ Top (yes, even the Afterburner- and Recycler-era videos). That little ol’ band from Texas has partnered with the hip liquor product Jeremiah Weed to debut the first single from their upcoming, years-in-production, Rick Rubin-produced, as-yet-untitled album. 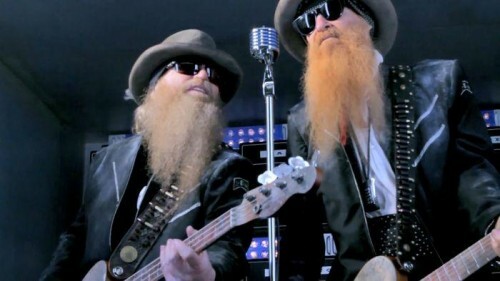 “I Got To Get Paid” shows up in the new Jeremiah Weed ad, in which convenience store customers get surprised by band members Billy Gibbons, Dusty Hill and Frank Beard playing inside the Jeremiah Weed refrigerating cooler. Sweet. Check out the results here (do we see an Eliminator-type vehicle in there? ), but when will we get the new album, and maybe some new videos? Billy Gibbons told Billboard magazine in March that it was “down to the seeds and stems” in picking the good songs for release, so hopefully the album will be fired up by the time the band hits the road on its Gang of Outlaws tour at the end of May.